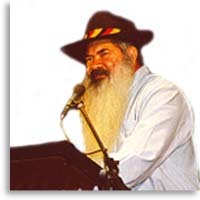 Patrick (Pat) Dodson is a former Chairman of the Council for Aboriginal Reconciliation of Australia and one of the great champions of the indigenous Aboriginal people of Australia. Yet he is, as journalists have remarked, no "self-publicist". Perhaps the tenor of his life is best understood if one knows about his grandfather, a leader of the Aboriginal Yawura people. Paddy Djiagween, Pat's grandfather, was introduced to the Queen of Australia and the Commonwealth when she visited the remote town of Broome of Western Australia in 1963. Paddy, contrary to all protocol, asked: "Why can't we have the same rights as the white man?" Her Majesty indicated her wish that he have full rights. Paddy walked across to the Continental Hotel and was refused a beer because of the colour of his skin. An aide of the Queen was summoned. Paddy was served a beer. "He sipped his beer" said Pat Dodson, "with a sense of gratitude due more to the achievement than thirst. He was not a big drinker but the right to drink was a liberty denied by government and statute and rights had to be struggled for and won." Pat Dodson was orphaned at the age of 13 by the death of his father in 1960. He was made a ward of the State but his sisters agreed that he should accept a scholarship to send him and his brother Mick, to study at Monivae College in Hamilton, Victoria. Six years later, although he was the only Aboriginal at the College, he was elected head prefect. He also studied for the Catholic priesthood but broke with the Church in 1981 over his insistence that many ancient Aboriginal rites were a celebration of the same spiritual force as worshipped by Christians. In 1989 Pat Dodson became a Commissioner of the Royal Commission into Aboriginal Deaths in Custody. In 1991, he was appointed Chairman of the Reconciliation Council. Australians, both Aboriginal and white, were rocked by the "Mabo Case", a decision by the highest law courts that Aboriginal people had rights to land hitherto considered freehold. A subsequent "Wik Case" reinforced this view. The Commonwealth Government introduced new legislation which caused widespread and emotional debate amongst both Aboriginal and white Australians. Pat Dodson, although calling for reason, found himself unable to support the legislation. He retired, in 1997, from the Reconciliation Council. "I fear" he said. "for the sprit of this country". The future, for all Australians, has yet to be resolved.